DNA immunoprecipitations were performed with 1 μg of genomic DNA from mouse embryonic stem cells and either 10 μl of 5-Hydroxymethylcytosine (5-hmC) (HMC31) Mouse mAb or 10 μl of Mouse (G3A1) mAb IgG1 Isotype Control (DIP Formulated) #98528 using SimpleDIP™ Hydroxymethylated DNA IP (hMeDIP) Kit #95176. The enriched DNA was quantified by real-time PCR using mouse Aqp2 exon 1 primers, SimpleDIP™ Mouse Intracisternal-A Particle (IAP) LTR Primers #74803, mouse Lamc3 exon 1 primers, and SimpleChIP® Mouse GAPDH Intron 2 Primers #8986. The amount of immunoprecipitated DNA in each sample is represented as signal relative to the total amount of input DNA, which is equivalent to one. 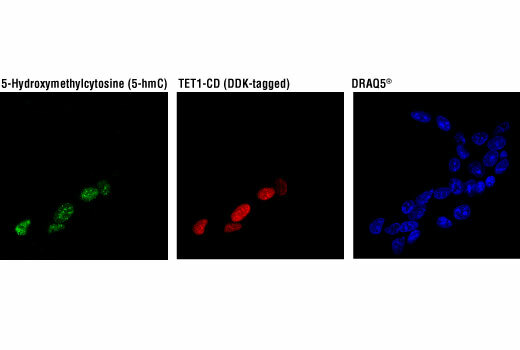 Confocal immunofluorescent analysis of 293T cells transfected with a construct expressing DDK-tagged TET1 catalytic domain (TET1-CD) using 5-Hydroxymethylcytosine (5-hmC) (HMC31) Mouse mAb (green) and DYKDDDDK Tag Antibody #2368 (red). Blue pseudocolor = DRAQ5® #4084 (fluorescent DNA dye). As expected, 293T cells expressing TET1-CD (red) exhibit inccreased levels of 5-hydroxymethylcytosine (green). 5-Hydroxymethylcytosine (5-hmC) (HMC31) Mouse mAb specificity was determined by dot blot. The same sequence of a 387-base pair DNA fragment was generated by PCR using exclusively unmodified cytosine, 5-methylcytosine (5-mC), 5-hydroxymethylcytosine (5-hmC), 5-carboxylcytosine (5-caC), or 5-formylcytosine (5-fC). The respective DNA fragments were blotted onto a nylon membrane, UV cross-linked, and probed with 5-Hydroxymethylcytosine (5-hmC) (HMC31) Mouse mAb. The upper panel shows the antibody only binding to the DNA fragment containing 5-hmC, while the lower panel shows the membrane stained with methylene blue. 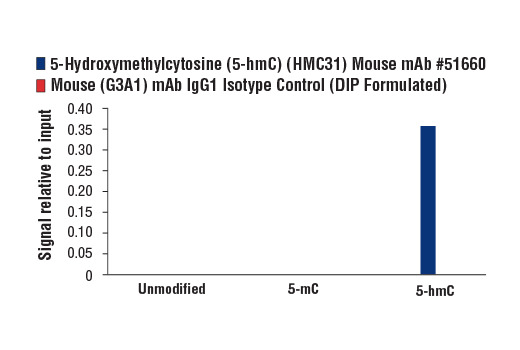 5-Hydroxymethylcytosine (5-hmC) (HMC31) Mouse mAb specificity was determined by ELISA. 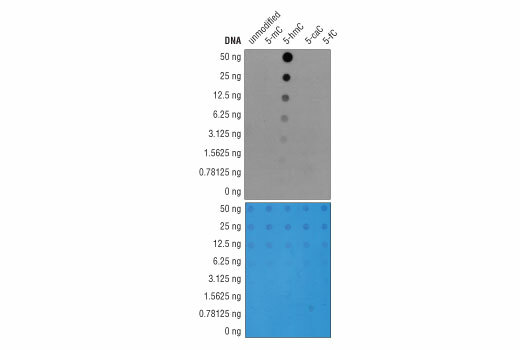 The antibody was titrated against a single-stranded DNA oligo containing either unmodified cytosine or differentially modified cytosine (5-mC, 5-hmC, 5-caC, 5-fC). 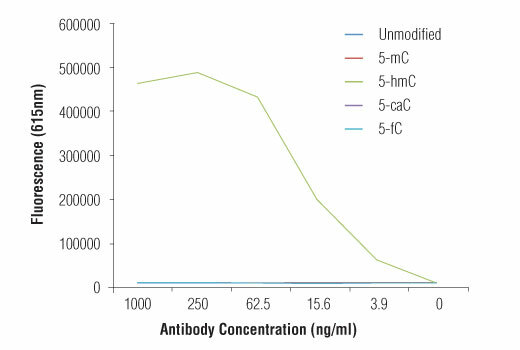 As shown in the graph, the antibody only binds to the oligo containing 5-hmC. 5-Hydroxymethylcytosine (5-hmC) (HMC31) Mouse mAb specificity was determined by DNA immunoprecipitation. DNA IPs were performed with genomic DNA prepared from mouse embryonic stem cells, spiked with DNA containing either unmethylated cytosine, 5-methylcytosine (5-mC), or 5-hydroxymethylcytosine (5-hmC). 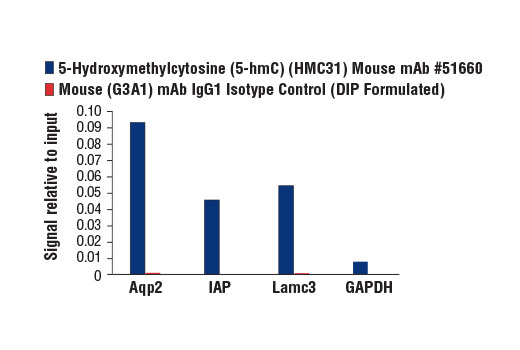 IPs were performed using SimpleDIP™ Hydroxymethylated DNA IP (hMeDIP) Kit #95176. The enriched DNA was quantified by real-time PCR using primers specific to the spiked-in control DNA sequence. The amount of immunoprecipitated DNA in each sample is represented as signal relative to the total amount of input DNA, which is equivalent to one. 5-Hydroxymethylcytosine (5-hmC) (HMC31) Mouse mAb recognizes endogenous levels of 5-hmC; however many cells and tissues contain very low levels of 5-hmC that may fall below the detection limits of this antibody. This antibody has been validated using ELISA, dot blot, and MeDIP assays and shows high specificity for 5-hmC. Monoclonal antibody is produced by immunizing animals with 5-hydroxymethylcytidine. Methylation of DNA at cytosine residues is a heritable, epigenetic modification that is critical for proper regulation of gene expression, genomic imprinting, and mammalian development (1,2). 5-methylcytosine is a repressive epigenetic mark established de novo by two enzymes, DNMT3a and DNMT3b, and is maintained by DNMT1 (3, 4). 5-methylcytosine was originally thought to be passively depleted during DNA replication. However, subsequent studies have shown that Ten-Eleven Translocation (TET) proteins TET1, TET2, and TET3 can catalyze the oxidation of methylated cytosine to 5-hydroxymethylcytosine (5-hmC) (5). Additionally, TET proteins can further oxidize 5-hmC to form 5-formylcytosine (5-fC) and 5-carboxylcytosine (5-caC), both of which are excised by thymine-DNA glycosylase (TDG), effectively linking cytosine oxidation to the base excision repair pathway and supporting active cytosine demethylation (6,7). TET protein-mediated cytosine hydroxymethylation was initially demonstrated in mouse brain and embryonic stem cells (5, 8). Since then this modification has been discovered in many tissues, with the highest levels found in the brain (9). While 5-fC and 5-caC appear to be short-lived intermediate species, there is mounting evidence showing that 5-hmC is a distinct epigenetic mark with various unique functions (10,11). The modified base itself is stable in vivo and interacts with various readers including MeCP2 (11,12). The global level of 5-hmC increases during brain development and 5-hmC is enriched at promoter regions and poised enhancers. Furthermore, there is an inverse correlation between levels of 5-hmC and histone H3K9 and H3K27 trimethylation, suggesting a role for 5-hmC in gene activation (12). Lower amounts of 5-hmC have been reported in various cancers including myeloid leukemia and melanoma (13,14). Hermann, A. et al. (2004) Cell. Mol. Life Sci. 61, 2571-2587. Turek-Plewa, J. and Jagodziński, P.P. (2005) Cell. Mol. Biol. Lett. 10, 631-647. Okano, M. et al. (1999) Cell 99, 247-57. Li, E. et al. (1992) Cell 69, 915-26. Tahiliani, M. et al. (2009) Science 324, 930-5. He, Y.F. et al. (2011) Science 333, 1303-7. Ito, S. et al. (2011) Science 333, 1300-3. Kriaucionis, S. and Heintz, N. (2009) Science 324, 929-30. Globisch, D. et al. (2010) PLoS One 5, e15367. Gao, Y. et al. (2013) Cell Stem Cell 12, 453-69. Mellén, M. et al. (2012) Cell 151, 1417-30. Wen, L. et al. (2014) Genome Biol 15, R49. Delhommeau, F. et al. (2009) N Engl J Med 360, 2289-301. Lian, C.G. et al. (2012) Cell 150, 1135-46. SimpleDIP is a trademark of Cell Signaling Technology, Inc.